Directorate of Library Services, Assam Recruitment 2017- Librarian, Junior Assistant & Counter Attendant Vacancies. - Jobs4NE : Jobs in Assam and North East India. 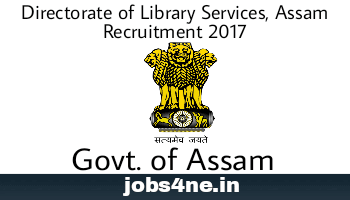 Directorate of Library Services, Assam Recruitment 2017- Librarian, Junior Assistant & Counter Attendant Vacancies. Applications are invited from Indian citizens in Standard Form as published in Part IX of Assam Gazette for filling up the posts mentioned below for Sub-Divisional Library, Kaliabor under the Directorate of Library Services, Assam in the scale of pay with Grade Pay as indicated against each category of posts and carrying usual allowances as admissible under rules. Last date for receiving of application: 30-06-2017. Total no. of Post: 03 Nos. Scale of Pay: Rs. 14000-49000/- + Grade Pay Rs. 8700/-. Scale of Pay: Rs. 14000-49000/- + Grade Pay Rs. 5600/-. Scale of Pay: Rs. 14000-49000/- + Grade Pay Rs. 5000/-. i) Bachelor degree in any discipline along with Bachelor/Master degree in Librarian Library & Information Science from any recognized university. ii) Having certificate and proficiency in Computer skills in use like MS Office, Internet e-mail correspondence etc. along with computer application experience in library field. i) Bachelor degree from any recognized university. ii) Having certificate and proficiency in computer skills in use like MS Office, Internet e-mail correspondence etc. i) HSLC examination passed from any recognized Board/Council or passed any examination declared equivalent thereof by the Govt. ii) Having certificate and experience in computer application. Age Limit: Candidates must not be less than 18 years and more than 38 years of age as on 1st January, 2017. Relaxation of age for candidates of SC/ ST and all other categories will be as per Govt. Rules in existence. Application fee: The candidates who have no BPL certificate must submit Treasury Challan of Rs. 250/- belonging to General category and Rs. 150/-belonging to SC, ST and OBC category. The amount of fee will have to be deposited in the Head of Account “0070 other Administrative Services”. Candidates having BPL certificate and candidates having caste certificate of SC, ST and OBC category must submit copy of respective certificate attesting by self with his application. How to Apply: Application along with self attested copies of all testimonials in support of their qualification, computer education, age, caste, Employment Exchange card etc and two copies of passport size photograph of candidates must reach the office of the Directorate of Library Services, Assam, Guwahati on or before 30th June, 2017. One self addressed envelope of I lcm x 25cm size affixing thereupon postal stamp of Rs. 5/- only should be furnished along with the application. Candidates will have to super scribe the name of the post applied for at the top of the sealed envelope carrying the application form.